Simply buy Police Magum pepper spray and you will get a 2 oz.pepper spray unit that holds 24 half second sprays of blistering hot(but safe)pure pepper spray and easily fits into a pocket or purse. 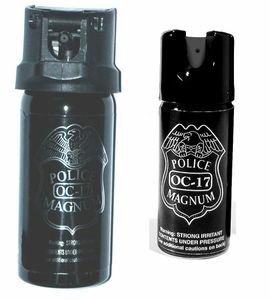 Police Magnum is the same product used by many police departments, security guards, bail bondsmen and other professionals (Atlanta Zoo). Because of the pharmaceutical grade propellant you get a great range of 12 feet to get them before they get you. Contains 2 million SHU pepper spray Guaranteed OC contents. This is a very effective formula which is TASER* device safe and contains no harmful ingredients. Twist Lock Top or Flip Top both have stream spray pattern. A black nylon holster is available for $3.95 with purchase of pepper spray. Also available, add a jogger hand strap. Effortlessly keep your full size 2 oz. pepper spray in your hand while jogging, hiking, biking or walking. Must use ground shipping, shipping by air is not allowed.